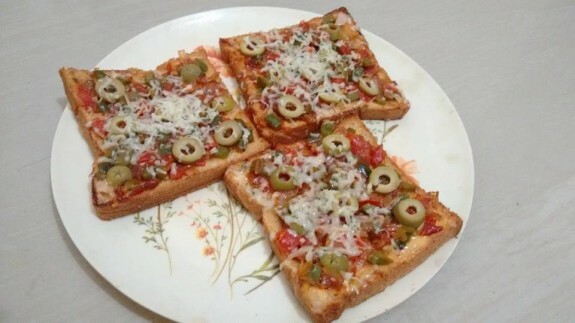 Bread Pizza is a delicious recipe which you can make easily at home. As this recipe needs some normal vegetables which are required for Sandwich, so you can prepare this recipe anytime either for breakfast or for snacks at your home to make your nearest one feel happy. Serve this excellent, tasty Home made bread Pizza with Mojito or some juice. 1. Heat olive oil in a pan and add peppercorns. Saute for few seconds. 2. Add chopped garlic and after getting a good aroma of garlic, add chopped onion. Saute for few minutes and add chopped capsicum. Saute everything for 102 min on medium flame. 3. Now, add chopped tomatoes and tomato ketchup or tomato puree. Add sugar, salt, chilli flakes and mix all well. Cook for 1-2 mins more while stirring. 4. If you have oregano and basil leaves, then add these now and mix well. Remove peppercorns and discard them. 5. Switch off the gas, divide it into 3-4 portions and keep aside. 6. Now, Toast the bread with light butter in a preheated oven at 200 degree for 5 mins. You can toast this in a simple tawa/pan also. 7. Now spread each portion of above pizza sauce mixture on top of the bread evenly. Add olive slices above that and sprinkle cheese over it. 8. Now, bake it for 5 mins or till cheese melt. You can also keep it in tawa/pan for 2 mins in low flame and cheese will melt.